Abandon all hope ye who dream to be fawned over and lifted high upon loving shoulders, who wish to be touted as the best (better than the rest), who dream their music may one day cause young men to break a sweat and old men (that's me) to have hot flashes, who aspire to the lofty goal of sharing a stage and a nationally televised moment with a 'Mr David Letterman' (and being 'Sixeyes Best of The Year'. - it's pretty much the same thing, no?) For this year, the year of our Lord, Two Thousand and Seven, The National and their album, Boxer, are the best. Well, that thing of being lifted upon loving shoulders, I don't mean that literally, there's just one of me and five of them, I could lift one, maybe one of the Dessners, they're not too.... wait, my backs acting up. It's just metaphorical, the shoulder lifting thing, but it's meant truthfully and honestly, this is the best album of the year! The band is at the top of their game with Boxer. There is always something to grab your ear, from the Dessner brother's guitar work, to the rhythm section of the Devendorf brothers (particularly Bryan's drumming), to singer Matt Berninger's lyrical imagery. Short, sharp lyrical phrases which needle and punch their way into you and yet are always wrapped in the soft leather of Berninger's vocal. These are just the parts, together their sum totals 'The Best Album of The Year'. And yes, I do realize the year has a couple of months to go, but come on, have you heard the album? 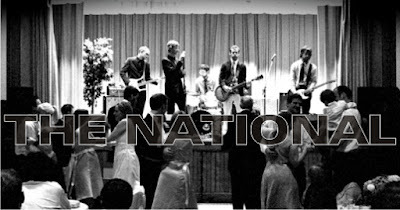 The National can be found at eMusic, as well. Alligator (their previous album) and Boxer are there along with the earlier records. A free trial offer at eMusic gets you 25 mp3 downloads with no strings attached. Visit here to watch trailers from the documentary on the band recording Boxer - 'A Skin, A Night'. The film is in post-production right now. mmm, a bold and early statement, though i wouldn't say premature. for me, it's betweeen Boxer and Iron & Wine's Shepherd's Dog, i think. your blog is a pleasure, thanks. migrant - thanks for your comment, i appreciate it. And I'll agree that Iron & Wine issued a great record, it's just that The National move me in many different ways, including nostalgic. I'm with you. Boxer it's the one in 2007 like Funeral was in 2005! "walk away now and you're gonna start a war"
Boxer is up there, but I don't think I'd give it the nod. This is such a great year for music that it's a tough choice, but right now my frontrunners are Spoon's Ga Ga Ga Ga Ga, Okkervil River's The Stage Names and Feist's The Reminder. And Radiohead. See? It's tough. I'm with you on this one. Awesome record following a long & strong history of solid albums by this band.